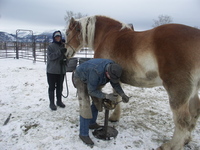 Our farrier, Rich Boyle, came out today for his regular visit to trim the horses' hooves. With 27 horses to trim, this is basically an all-day affair now for Rich. 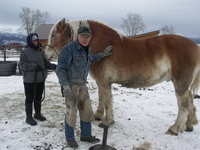 In the first photo Rich is working on Beaver, one of our two sighted Belgian draft horses. (You'll read more about Beaver and his brother Rooster in our spring 2006 newsletter.) That's Alayne bundled up against the cold, holding on to Beaver. Because these guys are so big -- they weigh about 2,000 pounds, about twice what an average horse weighs -- Rich uses a custom iron stand to hold up their hooves. Their feet are just too heavy to hold while trimming. And in the second photo, you can see what Rich actually looks like. He says that each Belgian hoof takes as much effort to trim as FIVE regular horse hooves. Yikes. These draft horses are quite a work out!